Do you have a whole stack of worsted weight yarn in in your stash, have joined a monthly yarn club, or are a Tosh Limited Edition Color fan? 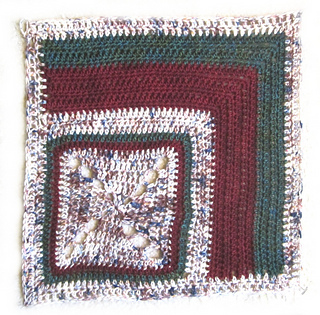 Here’s a fun and useful project to use up 12 skeins in different colors: Worked in log cabin-style squares, each row of squares incorporates 3 colors in different sequences, using the same amount of each per row. 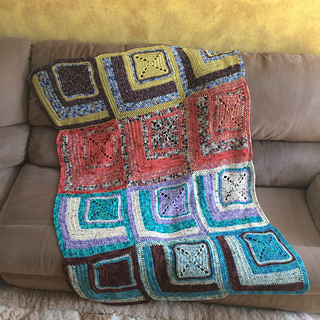 At the end of the year, or once you have used up your 12 colors, you can join the squares in order, or any way you like for a colorful and cozy throw! 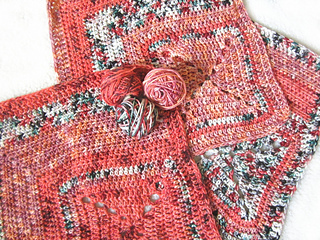 The Semi-Precious Throw was inspired by this year’s limited edition collection of Madelinetosh “Semi-Precious Tosh”. This year’s blanket is made of 12 log-cabin style blocks. Each set of 3 blocks uses 3 colors of consecutive months (January – March, April – June, July – September, October – December). 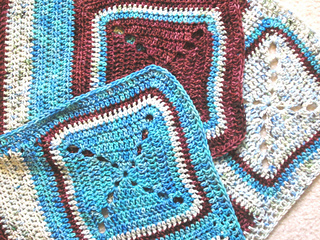 Since you need all 3 colors of a group to finish each block, crocheting in the first two months of each quarter will be light. 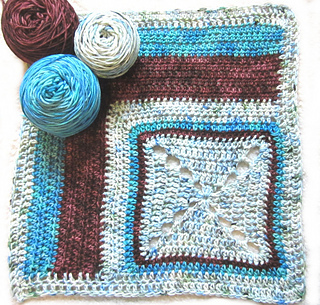 The pattern will be updated at the end of each quarter, showing pictures of all squares to date. 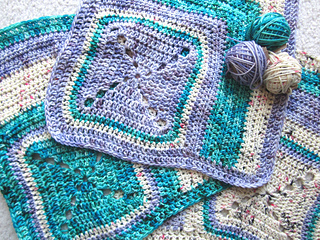 If you are looking for the knit version of the Semi-Precious Blanket, you can find it here. The first block photo shows Block A with January-March’s colors. The second photo shows Blocks A, B and C with January-March’s colors. The third photo shows Blocks A, B and C with April - June’s colors. The fourth photo shows Blocks A, B and C with July - September’s colors. 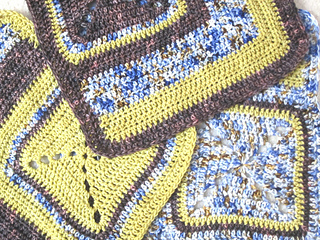 The last photo and the A, B and C sample blocks shown in the first version of the pattern used Madelinetosh – Tosh Vintage in Horoscope (Color 1), Heartbeat (Color 2), and Shire (Color 3). Malabrigo Rios, Brooklyn Tweed SHELTER, Knitpicks Swish Worsted; or any other washable worsted weight yarns.